A gay Catholic group wants to shower the Pope with ashes during his visit to NYC next month. 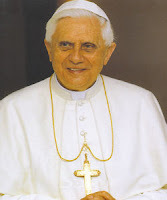 A group that works for the rights of gay, lesbian, bisexual and trans in the Roman Catholic church is planning a series of protests against Pope Benedict during his visit to the US next month. The Rainbow Sash Movement said it is calling on "Catholics of good will" to take the Papal visit as an opportunity to shower the Pope mobile with ashes instead of confetti. "Ashes are an ancient and appropriate greeting for a sinner who has caused the Church so much division and pain," RSM said in a statement. "We will also be greeting him with whistles; these were used by the Polish People to show shame for the violation of human rights by the Communist Government prior to the end of the cold war. "This will be a loud call for reform, that the Pope will be unable to turn a deaf ear to." The Rainbow Sash Movement says: "We will not enter any Churches but we will bring ashes to reign down on the Popes motorcade, and call on individuals to blow whistles at any public papal events such as outside of St. Patrick's Cathedral, Ground Zero, St. Joseph's Seminary, and Yankee Stadium as a sign of our disgust over the way the clergy abuse scandal has been handled under his leadership."